Just yesterday, Microsoft announced their latest tablet, the Surface 3, which is the thinnest and lightest Surface they’ve ever shipped. 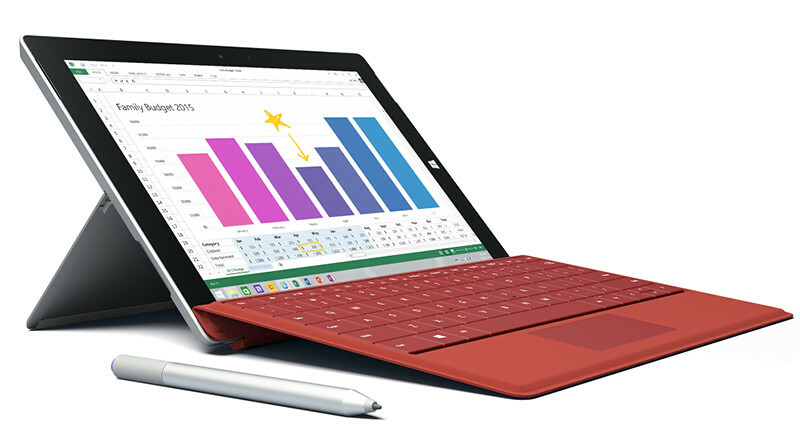 Powerful and efficient, Surface 3 is optimized to run full Windows and Office and features long battery life. The ability to run Windows apps and the versatile pen experience — great for taking notes or marking documents — make Surface 3 ideal for students, schools and anyone looking for a portable device to get things done. A 4G LTE-ready version,2 Surface 3 (4G LTE), will offer even more mobility. Powered by the new quad-core Intel Atom x7 processor, Surface 3 is quick and responsive but designed to maximize efficiency with up to 10 hours of video-playback battery life. A range of storage and memory configurations gives people choice in power and capacity. The beautiful 10.8-inch ClearType HD multi-touch display featuring 3:2 aspect ratio, stereo speakers with Dolby Audio-enhanced sound, and the elegant and durable magnesium design are just a few of the benefits of Surface 3 that customers will recognize from Surface Pro 3. The three-position kickstand is ideal for using Surface 3 while working at a desk, sitting on a couch or holding in the palm of a hand as a natural writing surface. And with Surface 3 (4G LTE), anyone who needs connectivity on the go can get Internet access wherever their tasks take them. To help people get even more done, Surface 3 and Surface 3 (4G LTE) ship with full Windows 8.1 and can be upgraded to Windows 10 for free when available. They also come complete with a one-year subscription of Microsoft Office 365 Personal, including Outlook, Word, Excel, PowerPoint and OneNote, plus OneDrive cloud storage. Full device specs are available here. Surface 3 and Surface 3 (4G LTE) can be paired with new accessories: Surface 3 Type Cover is offered in a variety of colors and features an improved trackpad and responsive keyset for fast, accurate typing, alongside four vibrant Surface Pen colors — silver, black, blue and red. The Surface 3 Docking Station lets people easily connect to an external monitor and all their desktop devices, and Surface 3’s full-size USB 3.0 port, Mini DisplayPort, microSD card reader and Micro USB charging port make it compatible with the Surface Pro line of adapters and ready for quick and easy connections to a variety of accessories. Surface accessories specifics can be found here. Surface 3 and new accessories will be available for pre-order starting March 31 through microsoftstore.com, Microsoft stores and select partner retailers in the following markets: Australia, Austria, Belgium, Canada, Denmark, Finland, France, Germany, Hong Kong, Ireland, Italy, Korea, Luxembourg, Malaysia, the Netherlands, New Zealand, Norway, Portugal, Singapore, Spain, Sweden, Switzerland, Taiwan, Thailand, the United Kingdom and the United States. Commercial customers should contact their authorized reseller for pre-order information. Starting May 5 through those same retailers and resellers, customers can begin purchasing Surface 3, Surface 3 Type Cover, Surface Pen, Surface 3 Docking Station and Surface 3 Screen Protector, with availability in all 26 markets by May 7. The tablet starts at $499.